Rupali did her schooling from Punjab and after that a Diploma Course from VLCC. She has worked in Chandigarh and Delhi as a Makeup Artist. 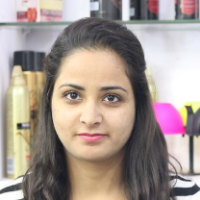 She is working as a Beautician at Blossoms Unisex Parlour since 2014. A makeup artist is an artist whose medium is the human body, applying makeup and prosthetics for theatrical, television, filmmaking, fashion, magazines and other similar productions including all aspects of the modeling industry. "After doing my schooling from Punjab, I did a Diploma Course from VLCC. I worked as a makeup artist in Delhi and Chandigarh. I have been working as a makeup artist at Blossom Unisex Salon since 2014."